jadi, ya engga ada tujuan apa-apa.
" 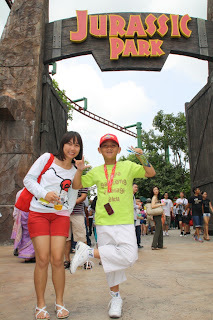 My blog is my diary, just for fun "
"This is a story when I and family went to universal studio singapore." 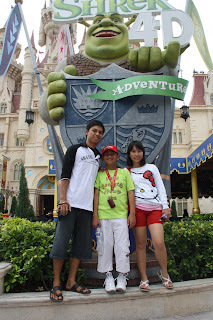 Sunday 24 April 2011 , about 11 am I and family arrived at USS (Universal Studio). 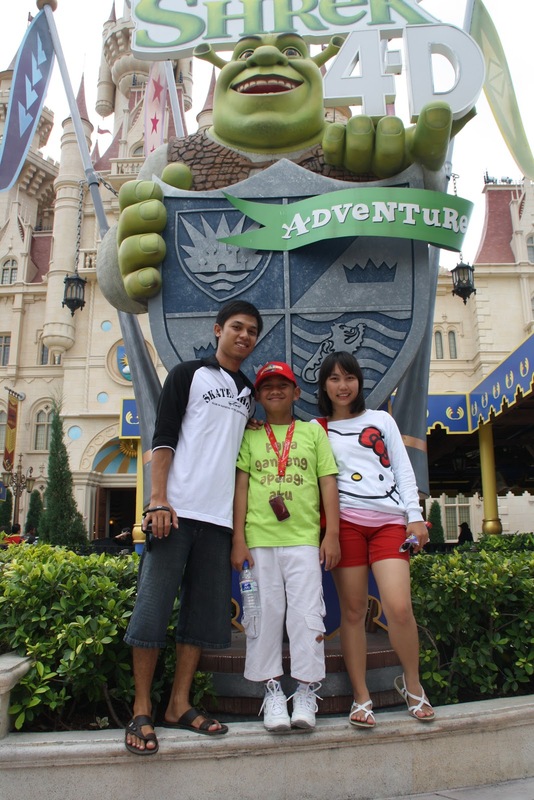 And then, after my dad completed all administration we all come in to USS. USS is almost same with dufan, but they have better decoration than dufan. USS is divided into 7 zones, Madagascar, the palace of Far Far Away from the world of Shrek, The Lost World, Ancient Egypt - a world full of ancient Egyptian mummies, Sci-Fi City and the last two zones takes the theme of the famous city in America that is Hollywood and New York. At first entry, there are Universal Studio Store so we bought some merchandise firstly, to bring at home. After that we walked back in the hollywood street. In USS after passing Hollywood street, there are two streets option. if we choose left street we will passed route (madgascar, far-far away, the lost world, ancient egypt, sci-fi city, new york) but if we choose right street we will passed route (new york, sci-fi city, ancient egypt, the lost world, far-far away, madagascar) I choose left street so for first I passed madagascar zone. Madagascar zone is an area with feel of a tropical forest, with unique animals and amazing like lemurs and foosas. Singing birds and the cries of monkeys broke the silence of the forest when you explore this areas. But only one game rides in here, King Julien’s beach party go round. Carousel themed madagascar. 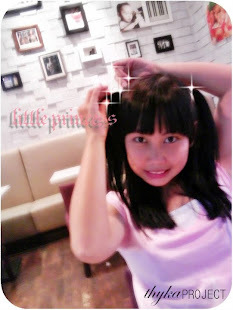 she said "she is cute and she has fat and big belly"
After that I and family entered far-far away zone. There are three rides here, Shrek 4D Adventure, Enchanted Airways (mini roller coaster) and spin magic potion (a fantastic Ferris wheel for children). but we only watching Shrek 4D movie. Next zone is The Lost World, where you can find the world of dinosaurs and Waterworld. In here there are 5 rides, I and my brother played in canopy flyer. We sit in flying vehicle and see the lost world areas with bird’s eye view. And played with family in Jurassic park rapids aventure, that cross the river raft ride through dinosaur habitats. We are very wet after played in this rides. For the another rides (dino soarin, amber rock clim, waterworld) We aren’t to go there. After have lunch, we are going to Ancient Egypt. There are 2 rides in here, Revenge of the mummy and Treasure Hunter. For first I and Family played at treasure hunters rides. We drive own desert with jeep car and abandoned egyptian excavation site. And in revenge of the mummy ride just me and my brother who’s playing because my mom, dad and my little brother scare for riding roller coaster. You should know this is a very scary roller coaster. Why? Because we will play in the total darkness indor room, and roller coaster not only runs fast but also get on and go back very fast and repeatedly. and there will be several sprays of fire in this ride. And then we go to Sci-Fi city zone, illustration of a futuristic city with some robots and aliens. There are 2 rides in this zone. Battlestar Galatica Cylon and Human, a very high roller coater with two different pathways. Roller Coaster Cyclon (blue track) roller coaster with dependent sitting position and tracks like cobra roll and Human (red track) roller coaster with normal sitting position but has speed and challenge higher than Cylon coaster. And Accelerator, I and my brother prefers to ride Cylon coaster, because we want to feel different sensations with another roller coaster. and you know what? riding a roller coaster with depending positions 3x more extreme than riding normal roller coaster . Because we'll feel our legs as will be hit roller coaster pillar. Finally we're walked in new york street, new york street is a street that's have design very same with real new york city. Where there are lots of shops on the right and left street. And also there're legendary artist along this road. So you can take pictures with your idol figures, such as Charlie Chaplin and Marilyn Monroe. Anyway this place is a very good place to take pictures. For rides in new york street there are 2 : Lights, Camera, Action! And Stage 28. For Lights, Camera, Action! we will watching movie made by Steven Spielberg with special effects that make us feel be in the film. Dimulai dari bulan Juli 2010, awal mula kami semua masuk dikelas ini, awal mula gue bertemu mereka . Pertama-tama masih saling ga kenal, jaim dan malu-malu. Tapiiii lama kelamaan semua mulai pada kelihatan belangnya . Jujur gue seneng bisa ada di kelas ini, anak-anaknya asik asik, ya walaupun ga bisa kompak 100% . Banyak cerita yang ada di GHOST. mulai dari waktu ngecet kelas, persiapan buat lomba kebersihan ( kita juaranya loh ), nyiptain lagu buat satpam tercincaah, nyiptain lagu buat si dia dan dia, nyiptain nama panggilan yang lucu lucu. , sapi, enyai, gacon, muka melas, ibab, teteh, unge, dogay, abang, ejut, pitik, wongka, eaaaa, tuyul, batu. contekan demi usaha bersama, skin head rambut sebagai protes dari aturan 321, arak-arakan waktu maulid nabi, tragedi gunting berdarah, terdampar, sampai kebakaran di kelas. Sedih duka, canda tawa dan masalah juga ga luput dari semua cerita anak-anak GHOST. Setelah UAN pasti udah pada sibuk masing-masing sampai akhirnya udah bener-bener lulus dan ga kumpul bareng lagi. ga duduk di kelas yang sama lagi, ga bisa ngecengin guru lagi, ga bisa ngeledekin si ini sama si itu lagi, ga bisa liat adik kelas ganteng/cantik lagi, ga bisa ngerumpi bareng lagi. Jadi yang gue harapin di sisa-sisa waktu yang tinggal sebentar lagi ini, kita bisa makin kompak. Dan ya setelah itu gue berharap nantinya diantara kita jangan putus komunikasi, tetep keep in touch ya teman-teman.